It feels like a sauna in my office today. It's funny what a difference a little heat makes in productivity, too. It's like my fingers each weigh ten pounds. At the rock gym, everything suddenly got a lot more difficult. Which is fine with me, except that I was moving up a grade (I was just starting to climb harder stuff). It's really a moot point--I know my current limitations, and I can tell pretty soon after beginning a problem whether or not it's going to challenge me. But it's like I was a B student yesterday, my work hasn't changed any, and now I'm suddenly a C student. Ach, well. I've just got more work ahead of me. Last week, late in the evening when it was quite dark, I walked across the street from our apartment to grab the mail. For whatever reason, I looked back at the apartment. There, in the middle of the black sky, was a huge white owl. It beat its heavy wings slowly. I watched it fly directly over my head, turn toward a brightly lit hillside, and drift away into the darkness. I know it was huge because it seemed like forever before it finally disappeared. I have a tendency to associate things like this with events in my life--more often than not, I'm looking for some kind of signal, a deeper meaning. Unfortunately, in today's day and age, there aren't any oracles to consult. At least, none that I trust. So when something like this happens, I let the memory of it sit quietly. Somewhere along the way, something wonderfully terrible or terribly wonderful might happen. Then I can connect the new thing with the old one, and maybe they make sense together. Most of the time, though, that doesn't happen. And that's okay, too. Libby has season tickets, just behind the plate, on the third base side. And she needed folks to go with her, so Amy and I happily obliged. We haven't been to a baseball game for a couple of years now (we used to sit in the "rock pile" at the Rockies games -- the upper deck behind right field) and we've never had such great seats. Someday, maybe, Portland will get a major-leage baseball team. Until then, though, I think PGE Park and the Beavers will do just fine. Yesterday, Matt and I accidentally ended up running through Forest Park during lunch. Usually, we run by the river, under the Broadway Bridge, by Union Station, and back up through Northwest Portland to our office. But yesterday, the road along the river was closed to pedestrians. So we turned around and headed straight for Montgomery Park. We felt better than we thought, so we found our way to Macleay Park, along a beautiful creek into heavily forested Forest Park, and home again. About halfway, on our way down Cornell, we stopped at the top of Northrup Street (at that point, the street is just a staircase) for a quick look at the city and the mountain. It's been a good while since I climbed Mt. Hood. When I think of it now, I'm not sure whether I'll ever climb a mountain again. Part of me clearly hopes so. The rest of me is hard to understand. It's 9:56pm on the West Coast and the light from the sun is just now fading. It was a perfect Portland summer day: hot all afternoon, but pleasant now. And everything is surrounded by the aura of fading sunlight. The sun has actually been gone for some time. But you know how light hangs around after the sun goes down, don't you? Alyssa and Tonya came to Portland to hang with me for a little while. They're doing a cross-country trip that boggles the mind. And I'm incredibly jealous. Anyway, they only really got about two hours of my time, which probably wasn't enough. But I'm glad they came by. Tomorrow, Amy and I are hosting the first meeting of a little, pretty informal writing group. I hope it inspires me to write some more. I really need the feedback that they might be able to give. And last but not least, I'm going to Germany in August. I'm incredibly excited about it. Lars and Anne are getting married on the Lake of Konstanz. We're going to spend the week after their wedding hanging out on an island in the lake. It just doesn't get any better! It's supposed to be 64 degrees today, with scattered showers. But the tree outside of my window is covered in scattered sunlight. So. At least this morning, it's beautiful out there. We were going to hike up Dog Mountain this weekend, but the weather didn't cooperate. Instead, Doug came over for burritos, and then Amy kicked both of our butts in Scrabble. It's pouring rain out there. I mean pouring. Not your standard Oregon drizzle. I love it, actually, except that Amy is taking a bunch of kids to the zoo today. But she brought a raincoat and a warm sweater, so she'll be fine. I'm sitting in my office, staring out of my window at a tree shuddering in the wind. The sun is shining, but it's cold out there. And that's spring in Oregon, for you. Warm today, cold tomorrow. Dry today, pouring buckets tomorrow. 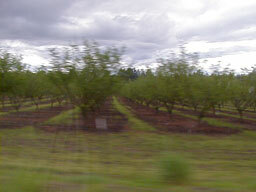 It's also the reason the west half of this state is lushgreen. Amy's coming to pick me up. We don't have any specific plans tonight (for the first time in months). I think we'll probably get out the Scrabble board. I'm aching to get outside. Everything within me is crying out for fresh, clean, brisk air. And quiet. And a reason to use my beautiful (but pitifully ignored) tent. Amy and I live in the country now, more or less. Our little town is the last place the busses from Portland stop before heading back into the city. When we go out, we often take back roads. 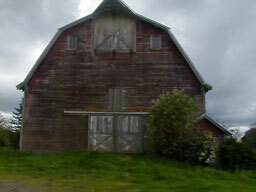 We drive by orchards, old barns, a pungent dairy, rusting sheds. On Monday we rushed to Wilsonville to see "American Beauty." I can understand why everyone loves the movie so much. It's beautiful. No question about it. But it's also terrible. We left, both of us in a bad mood, and wished we'd just spent more time driving. Ricky's right. There is so much beauty in the world. And I guess what I realized on Monday is that I didn't have to go see American Beauty to find it. I was looking closer before the film. The sun is shining like the head of a newborn. It's 74 degrees out there. Anyone up for a game of ultimate? I don't think I eat well enough. Every day, I feel like falling over at about 4pm. Without fail. Amy and I went to the coast on Sunday afternoon with Mike and Ashley. One hour there, one hour walking on the beach, and one hour home. 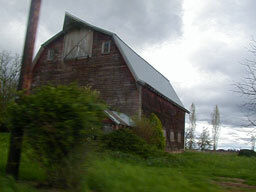 This page is an archive of recent entries in the Portland category. Geek is the previous category. Querida Zoe is the next category.